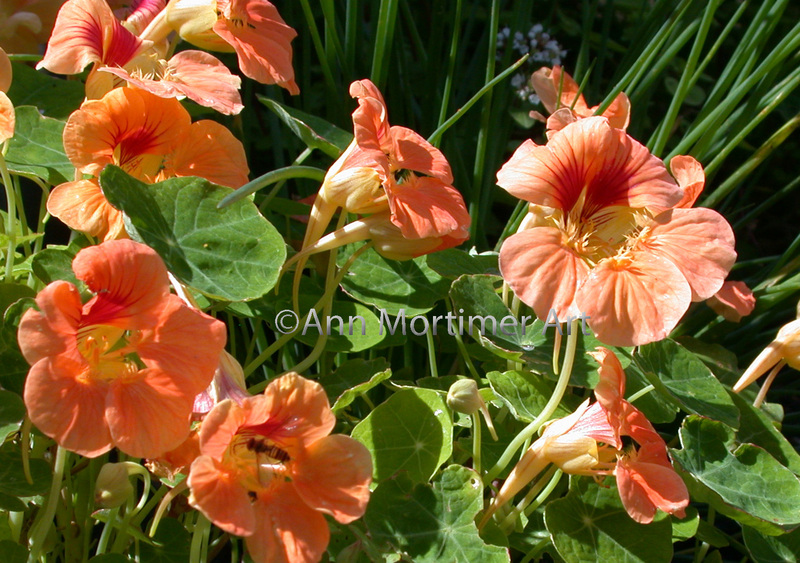 Nasturtiums…oranges, yellows and greens,winding tendrils and a negative painting fest. Love them! Nasturtiums…love them with their gorgeous vibrant egg yolk yellows and oranges, flat plate like leaves and pale winding tendrils and stalks. Monet knew his stuff when he had them crawling out into the gravel under the long pergola at Giverny. They just make me want to paint them and they are great for those hungry for a negative painting fest. So as always I’m painting them the only way I know how, even though they scream out to be designed into an art nouveau style composition. I hate to admit this but they haven’t grown in my garden this year. They often self seed among the lettuces but I must have been too tidy and weeded them out or something. Luckily I took photos last year and the year before when the sun was shining on them and there were cast shadows aplenty. I made a drawing using this photo and others in my collection. I like the drawing as it has solid lines and these flowers would be so good for an art nouveau sort of treatment with lots of black lines. 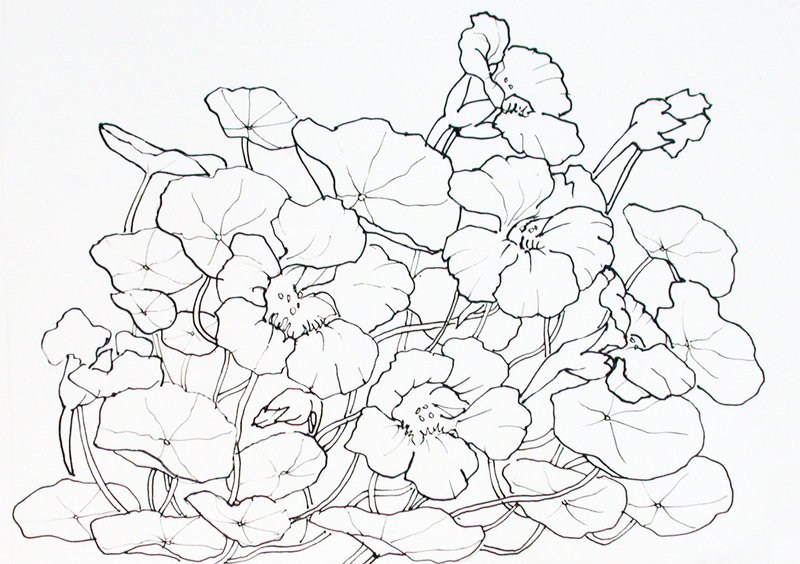 I remember seeing a Tiffany glass design featuring nasturtiums, so beautiful. 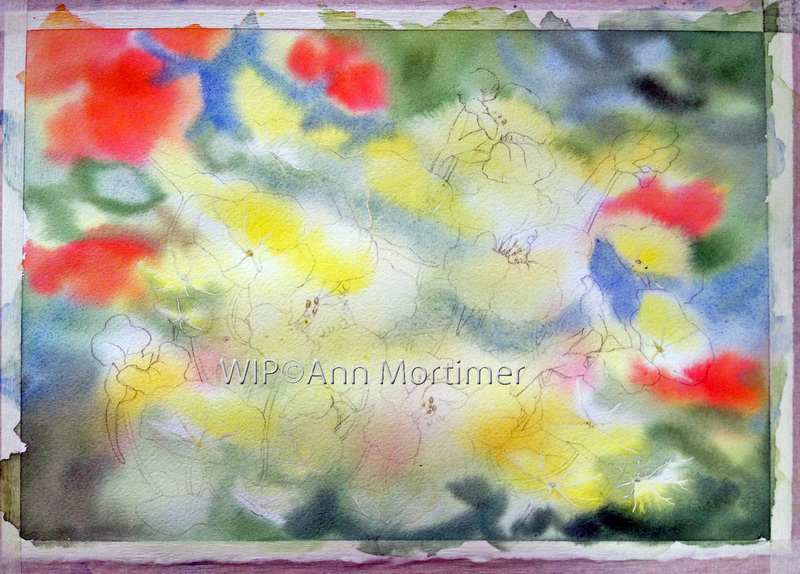 But because I love to do the negative painting stage, I have started as I always do with an all over wash of yellows and oranges, blues and greens. I can’t wait to get in there and find the negative shapes! Previous Previous post: Painting glass…always exciting! Next Next post: The walls, the walls… chickens, rose hips and orchids too!